You have an ignore list. Put me on it. Sorry TB, I think a lot of us appreciate what DL is doing here. He is working with what he has. I hope maybe some sub-forums are developed to go with the recruiting forum. Until then, proceed DL, good work! I don’t always agree with DL’s opinions or his methods, but he is positive, brings new information and is a valuable addition to these boards. A lot more so than some of these nattering nabobs of negativity. If thy eye offend thee, pluck it out. Put him on ignore. I don’t always agree with DB’s opinions or his methods, but he is positive, brings new information and is a valuable addition to these boards. A lot more so than some of these nattering nabobs of negativity. If thy eye offend thee, pluck it out. Put him on ignore. I agree. Why ask the mods to censor a poster? 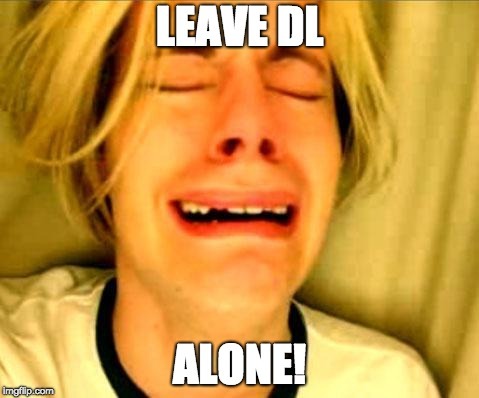 Its not as if DL is personally attacking you or critiquing your every post. What he is posting isn't personal. Who knows maybe the recruit or their family feels good about seeing they have their own thread maybe not? Just put him on ignore. Or if you dont like the threads dont read them. Keep the posts coming DL. Ironic that the person who is calling for this made a pledge a while back that he would stop posting-did not really follow through on this did you TFB? With the OP. What's next? a thread about "ESPN 100 ....... drove on 64 W, only 30 miles from the campus. Was he trying out the oxygen around here? Are we closing in?" Basketball forum mimics real life. Pick a side, wage word war, divide us all. Free speech is only free if you agree. Sorry about your frustrations but DL has too many supporters that appreciate his contributions. Why are there so many exclamation points in this thread title? Maybe it makes DL happy. I see nothing wrong with it.